This page shows a list of product releases I had the opportunity to be involved in, either as a designer, a concept programmer, a product owner, or now as Director of Products. In the fall of 2018, we released the follow-up to the smallest and most affordable Maschine in the portfolio. While the previous Mikro was aimed at providing almost all functionality of the bigger brother in a more compact form factor, Mikro MK3 is much more aimed at those interactions that really require a hardware: playing beats and performing with sound in realtime. For this, we managed to have the bigger pads and the responsive touch strip of Maschine MK3 in an even thinner and flatter device. This version finally brought real-time audio time-stretching to the world of Maschine. We have added this functionality in a very Maschine way: audio loops are embedded in patterns, can be used together with note-based instruments, and their pitch can be played via the pads or keys on a connected Komplete keyboard. This update to the Maschine software introduces Ideas View, a sketch pad for collecting ideas, combining them in scenes, and quickly arranging them on the timeline. For anyone who mainly uses Maschine as a start point for their creative process, this new view will provide a much clearer workflow and overview of the material. In addition, a longstanding user request has been addressed with the inclusion of an option to keep Group routings persistent when loading a new Group. This way, a setup with multiple audio or MIDI routings will remain intact when switching out the Group. A new release of our music production software that brings more detailed editing features for Maschine Jam users, including note length editing and per-step parameter modulation. For users of 4×4 Maschines, the update adds the “Variation” modes (features to randomize and humanize notes) and the much-loved “Lock” feature (to quickly create sound snapshots) to the “classic” line of hardware products. Additionally, we added the capability to modulate external MIDI gear from within Maschine. This device adds a new perspective on the Maschine production environment, being focused on “jamming” in the arrangement and creating new ideas along the way. It brings together direct access to the full project, a versatile step sequencer with melodic and multi-drum modes, and a row of eight “SmartStrips”. The latter are essentially touch strips on a new level of engineering, making them extremely responsive. A suite of performance effects was designed and developed to be used via these strips. 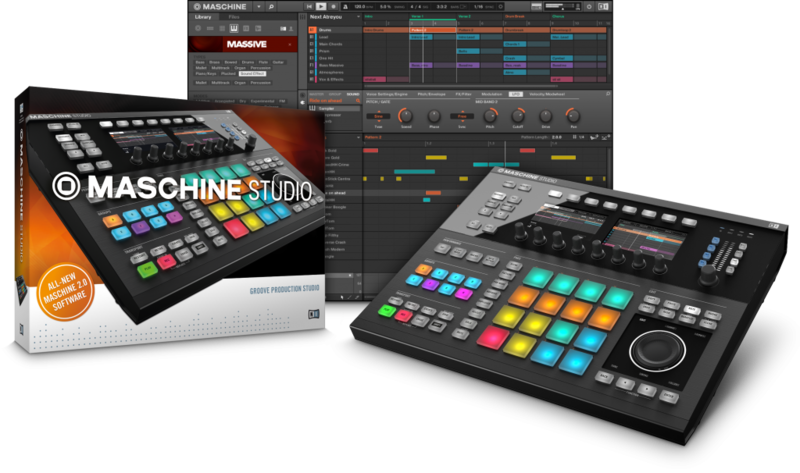 Altogether, Maschine Jam is a creative combination of a clip launcher, a step sequencing groove box, and a dub mixer. Several workflow improvements and loads of bug fixes. New slicer mode for “live slicing”. Full support for the new “Native Kontrol Standard”, a harmonization initiative to bring together software instrument makers and offer enhanced hardware integration with Native Instruments’ Komplete Kontrol S-Series of keyboards as well as Maschine. A big update for the “Maschine sound”. New drum synth engines, new effects, better workflows. New arpeggiator and scales & chords features for Maschine. These had been introduced on the Komplete Kontrol keyboards, with integration into Maschine in mind. This update also brought full hardware integration for the keyboards. This is an app I had the privilege to conceptualize together with Mouse On Mars. The initial idea was to build an instrument for iOS that was wild and unpredictable, unlike the tame and nice-sounding music apps that already populated the App Store. WretchUp is the result of this collaboration, which also brought Peter Kirn and Oliver Greschke on board. A lot of new features to streamline the workflow for users of Maschine 1.8, to bring more of their most-loved features over to the Maschine 2 codebase. This update also brought additional sound engines to enhance Maschine’s sonic variety. This was the biggest update in the history of Maschine. The software was completely rewritten, with a modern, service-based audio engine at its heart. Together with the software, we also released Maschine Studio, a new flagship controller in the Maschine line of devices, introducing high-resolution color screens to bring most of Maschine’s functionality directly onto the hardware. All existing devices continued to be supported by this new version. We introduced the second generation of the Maschine hardware family. The layout was kept intact, upon popular request. The most visible addition were the colored pads and group buttons. Under the hood, several major construction elements saw great improvements. 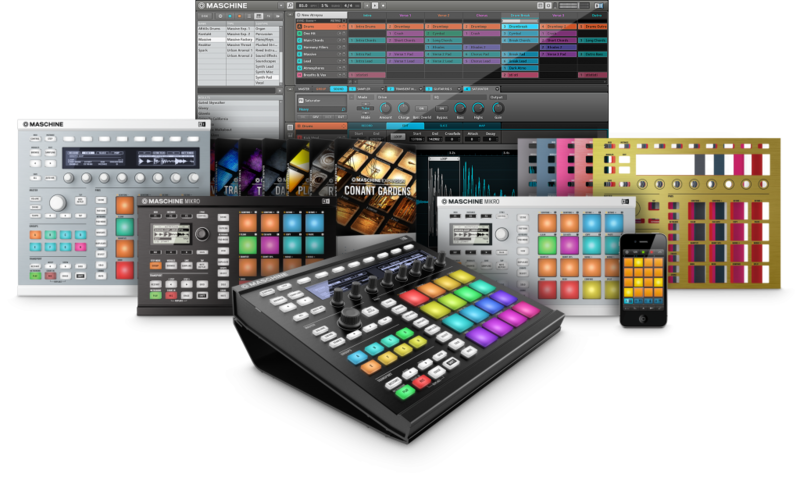 The Maschine 1.8 software was released at the same time, and brought support for the colors on the hardware as well as audio time-stretching and new recording capabilities.